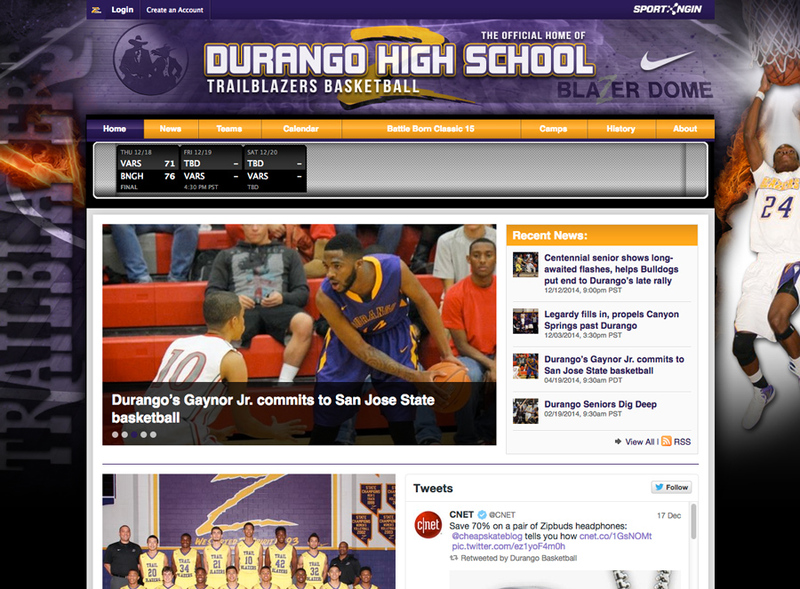 The rivalry between Las Vegas high school basketball powerhouses Bishop Gorman and Durango is so fierce it extends well beyond the court and goes deep into cyberspace. That’s right, two of the Top 5 basketball team sites on the Sport Ngin platform are separated by just a few miles in the same west Las Vegas neighborhood. Beyond examining the participants in one of the nation’s great high school hoops rivalries, we had a blast checking out the alumni page of Howard Pulley Basketball, the summer all-star program based out of Minneapolis-St. Paul. Included on the list of notable former players was none other than Joe Mauer, the Minnesota Twins star who played high school basketball at St. Paul’s Cretin-Derham Hall. We graded more than a dozen team sites on the platform, assigning points in categories such as Design, Navigation, Content, Team Pages, History, Recruiting, Alumni and more. The sites that rose to the top, as always, were the ones with the greatest depth and variety of content. The Howard Pulley Basketball Program, based in the Minneapolis-St. Paul area, was established in 1985. The program, which draws players from throughout Minnesota and the Midwest, counts Duke freshman point guard Tyus Jones and Stanford freshman forward Reid Travis among its recent alumni. Brandon Rush of the Golden State Warriors and Kris Humphries of the Washington Nets also played for Howard Pulley. Some striking design choices were made in the creation of this site, from the white, black and blue color scheme to the background and banner featuring the Minneapolis skyline and superstar alumn Jones. There’s a steady flow of content, even in the offseason as evidenced by the seven stories or videos posted between Dec. 4 and Dec. 16. Stats widgets and rosters are prominently displayed on the home page, but it takes some digging to find last summer’s schedule and results. A lot of effort went into building out the Alumni section of the site, which includes separate pages devoted to some of Howard Pulley’s most famous former players (who could forget the incomparable Khalid El-Amin?). The home page does a good job of directing traffic to various sections of the site. The news and calendar pages currently are blank. Founder/owner Rene Pulley named the organization in memory of his father, Howard L. Pulley. It’s fun to scan the Alumni section and get reacquainted with some names that otherwise might be forgotten. Remember Rick Rickert, the 2001 Minnesota Mr. Basketball who went on to play for the Gophers? As his Twitter account says, he’s played in just about every league in the world and is currently suiting up for the Chiba Jets in Japan. 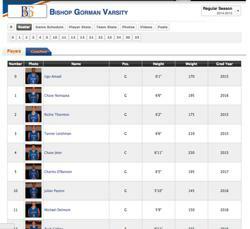 Bishop Gorman is a private, Catholic school with an enrollment of about 1,100 for grades 9 through 12. The school’s athletics program is among the best in Nevada and, for that matter, in the nation according to rankings produced by national media outlets such as USA Today and Sports Illustrated. The stylish design featuring a multi-layered blue and orange color scheme, the compact and modular home page, the abundance of information about the program, which has won 16 state titles. The schedule is posted and includes updated scores. The roster gets high marks for being decked out with quality player photos as well as heights and weights. However, the information on the Statistics page is from last year. The Staff page lists the team’s head coach (Grant Rice) and assistants (there are 10 in all) from last season but we couldn’t find any bio information. The Alumni page has yet to be built out. 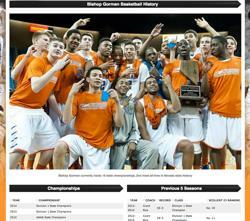 The History page lists the team’s state championships dating to 1960, and there’s video from the 2012 and 2013 championship games. The clean, compact home page serves as a nice springboard to the content scattered throughout the site. Some of the links in the top navigation are for as-of-yet blank pages. The Gaels were ranked No. 4 in the nation in the preseason by USA Today. 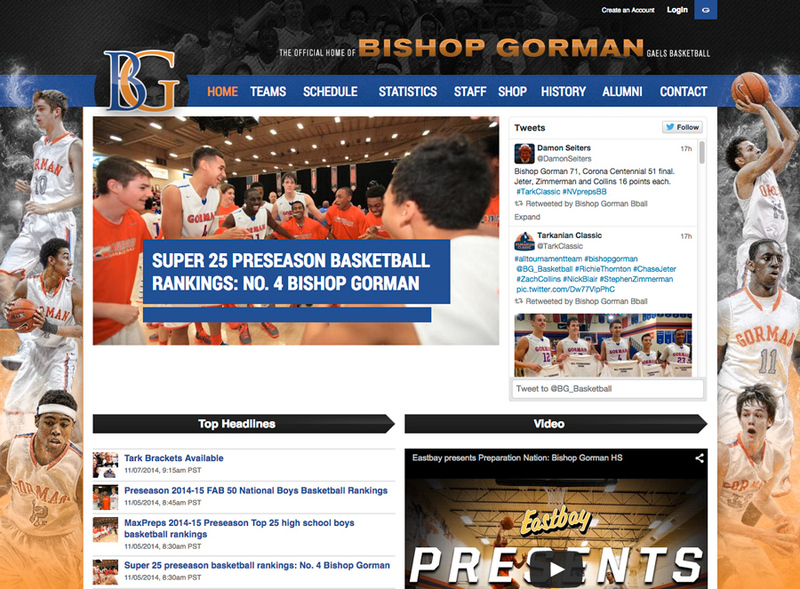 The home page video provides an impressive overview of the Gaels’ program and Bishop Gorman’s college-level facilities. 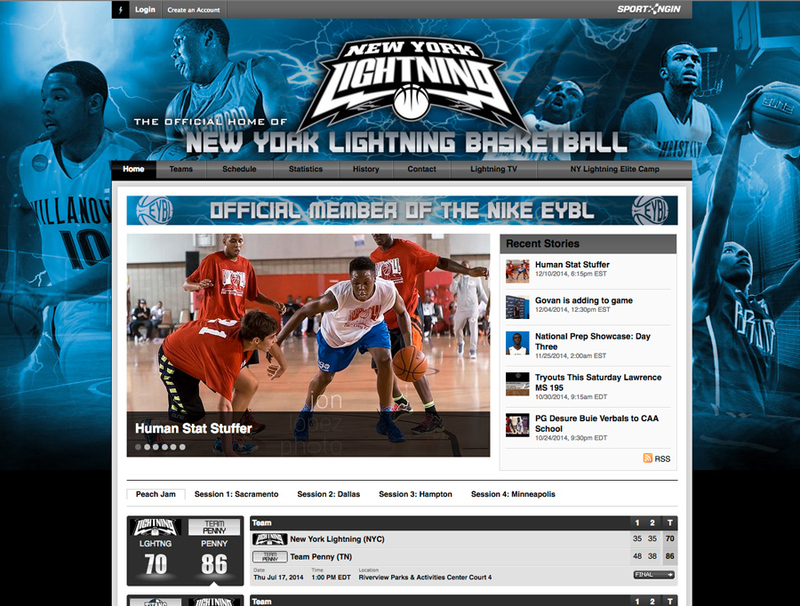 Lightning Basketball, founded in 1992, serves the New York City metropolitan area and is home to boys’ and girls’ teams with players as young as 13-and-under. 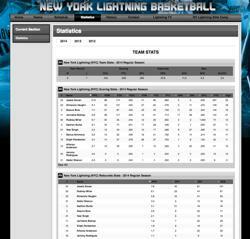 It’s easy to scroll through and see the results of all the Lightning’s games last summer on the home page, where a roster widget also resides. 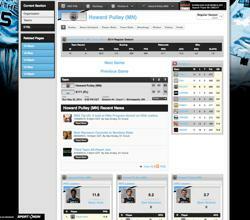 The Statistics page offers a comprehensive stats package from last season. The Staff page has photos and bios of Lightning co-director’s Dan Dingle and Shandue McNeill. The Alumni page lists where players from past teams - dating to 2006 - have landed in college. The top navigation is set up smartly, although the Elite Camp link could be removed at least for now (it is set up for last summer’s camp). Jessie Govan, the Lightning’s leading scorer and rebounder last summer, has committed to play at Georgetown. 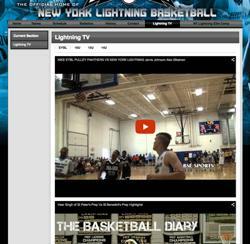 The Lightning TV page is home to multiple highlight videos for four of the Lightning’s teams (EYBL, 16U, 15U, 14U). 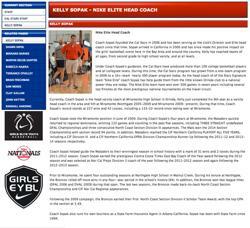 The Cal Stars, founded in 2006 by club director Kelly Sopak and based in the San Francisco area, are one of 32 Nike Girls Elite Youth Basketball League programs in the nation. The abundance of content, the subtle use of the iconic Golden Gate Bridge in the design, the in-depth tryout information. We didn’t see any team pages, thus we saw none of the fundamental content typically found on those pages. Pages are devoted to 11 coaches, and most of them are filled out with bio information. The alumni page lists players and their college destinations from each year dating back to 2006. In an unusual twist, the tables of information include the names of the parents of most players. In what is another rarity, much of the site’s content is found under the Home button in the top navigation. 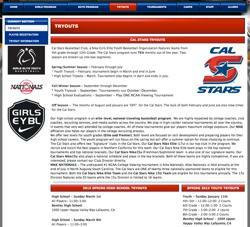 Cal Stars recently added a boys program to its offerings. 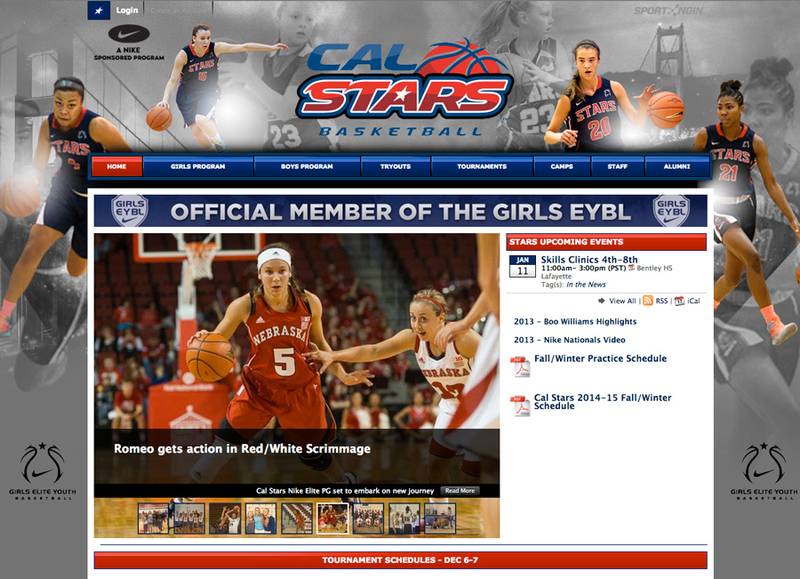 The home page has links to 2013 videos of Cal Stars teams competing at two national events. Durango High School is a public school in the west Las Vegas suburb of Spring Valley. It has an enrollment of about 2,600, although in the 2000-01 school year the number of students swelled to 3,647. 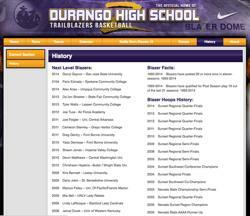 Durango’s boys basketball program won state titles in 1995 and 1996. While there’s much to be done to complete the site’s content offerings, many of the basic components – roster, scores, history – are posted. The varsity schedule is easy to find once you navigate to the team page, and scores appear to be updated frequently. We couldn’t find individual stats. A page is devoted to the Trailblazers’ coaches, with bio information explaining who is who, starting with head coach DeShawn Henry. The History page lists “Next Level Blazers”, former players who went on to play in college. The alumni list dates to 1995. Several of the links in the top navigation are for pages that are still awaiting content. One of the Blazers' biggest rivals is neighboring state and national powerhouse Bishop Gorman. The schools are separated by a mere 4.3 miles. The History page lists the Blazers’ playoff fate each year from 1995 to 2013.